Sega has been dead silent about the next Sonic, with fans eagerly awaiting any new information. That wait may soon end. With the help of a couple reliable tipsters, TSSZ has put together pieces of what appears to be a project dubbed Sonic Lost World. We must stress this could literally be anything, but we remain confident in the strong possibility of the information pointing toward a new Sonic project. First, there’s the trademark. Tipster AugieD let us know of an entry on the European Union’s Trade Marks and Designs Registration Office. 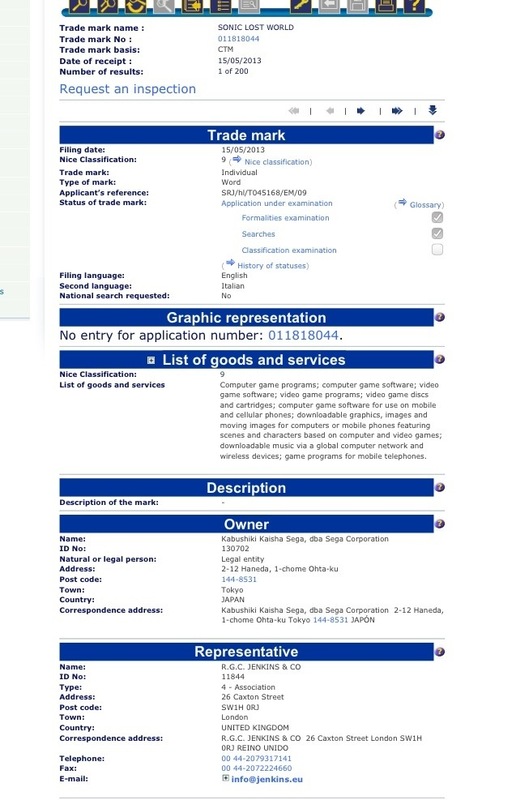 The singular Sonic Lost World is clearly registered to Sega via an agent in the United Kingdom. Furthermore, it appears the mark went live just yesterday on the 15th. Categories classified in the entry include slots in computer, video and mobile games. We don’t want to extrapolate too much out of that detail because, again, it could mean anything. What it almost certainly means is that this is a game. Where it ends up is anyone’s guess. Then, there’s the domain. Another Twitter tipster, Noku, alerted us to a domain registration for soniclostworlds.com, clearly set up by a Sega Europe employee. The singular soniclostworld.com is also similarly registered. We are not treating this information as rumor. Something is clearly happening behind the scenes, and with the help of our eagle-eyed tipsters, we’re able to corroborate and bring at least a piece of it to you right now. When we know more, so will you.